Initially the downside of the Sirius XM service for me was two-fold: the cost and the limitations on where I could listen. In the beginning, I could only listen in the car and it required special radio receiver and a service subscription. If another family member wanted to listen in their car, it required the purchase of another radio and subscription an expensive proposition even though the second subscription was at a slightly discounted price. The limitations were partially addressed when SiriusXM allowed subscribers to listen over the internet on their PCs. Today, Sirius XM has successfully solved the “where I can listen” conundrum. Besides an array of car radios that have satellite radio built in, Sirius has radios for Marine and Aviation as well continuing to expand its list of compatible web connected devices, including SiriusXM tabletop Internet radios, smartphones and tablets. Sirius continues to evolve and innovate in the audio space by not only making it possible to listen everywhere but making it more convenient to listen when you decide to do so. Recently Sirius added Start Now, TuneStart, Pause Live Radio and Show Alerts. 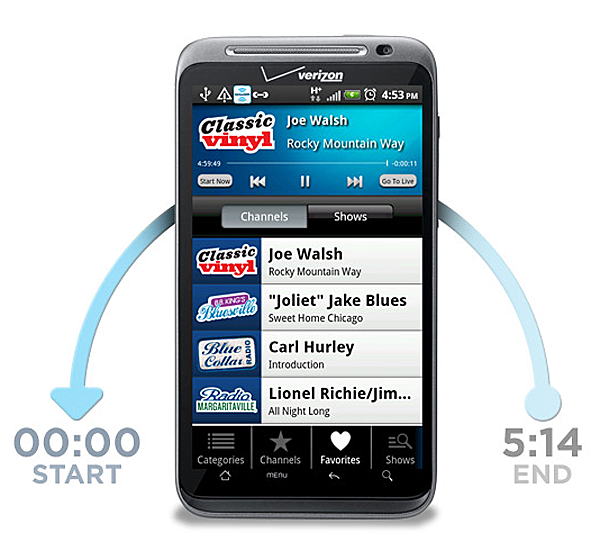 Start Now lets you go back in time and rewind up to 5 hours to select and listen to previously broadcast programming. TuneStart automatically starts the currently playing song at the beginning when changing channels. Pause lets you pause and resume programming when you have an interruption while listening so you no longer have to miss anything. Show alerts let you set reminders that remind you when your favorite SiriusXM shows are on. The new features are available across a selection of available devices. Some of the more capable smartphones, tablets and media players have free full featured downloadable SiriusXM mobile apps available. Sirius has mobile apps available for Android, Blackberry, iPhone, iPad and iPod Touch. You can add a smartphone to an existing qualifying Sirius plan for an additional $3.50 per month. If you don’t have have an existing qualifying plan, you can register for a 7-day free trial to SiriusXM Premium Online to try out the service before purchasing a plan. The Mobile apps work great, offers a large finger friendly user interface that offers a convenient way to browse available channels, one handed by List, Category or user defined favorites. Sirius offers a dizzying array of subscription packages starting at $7.99 for a la carte package to $19.99 for Sirius XM ALL-in-One, “all you can eat” on one radio plan. Sirius also offers a multiple-subscription discount available when you link a new Sirius XM radio to your current Sirius XM radio account. All quoted plans do not include taxes which are extra. Although I appreciate Sirius’s attempt at tiered pricing it has some problems. The $7.99 A La Carte plan lets you pick 50 channels from a “selection” of eligible channels. The service requires a special “A La Carte” capable Sirius Radio, does not include live games or races, excludes some premium programming and does not include online listening with SiriusXM Internet Radio. I would love to see Sirius offer a true a la carte package where the user can select 25 channels from the entire Sirius audio programming library for that $7.99 and listen online or across the full spectrum of devices with the top all you can eat plan toping out at a more reasonable $14.95. I would also like to see Family plans where you would pay full price for the first subscription but could add additional family members for a flat $5/month . I had previously dropped my second subscription from my family Sirius XM account. With the availability for me to add my smartphone for an additional $3.50 where I can listen from anywhere I’m happily part of a two subscription family again. For more information you can contact Sirius customer service at 1-888-539-SIRIUS (7474) or online at www.siriusxm.com.